The Criterion Channel has begun offering a selection of films by Mikio Naruse not released on Blu-ray or DVD by the label, and I plan to write about each of them (many of which I've never before seen) in chronological order of their release. 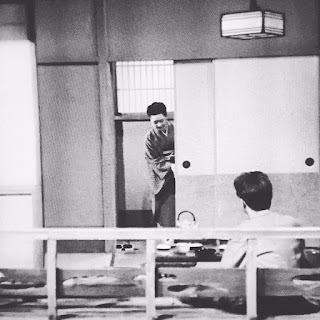 I'm starting with 1951's Ginza keshô [Ginza Makeup, a better translation than the title by which the film has been more commonly known in the west: Ginza Cosmetics, which suggests a product-line or shop-name, rather than the idea of concealment]. 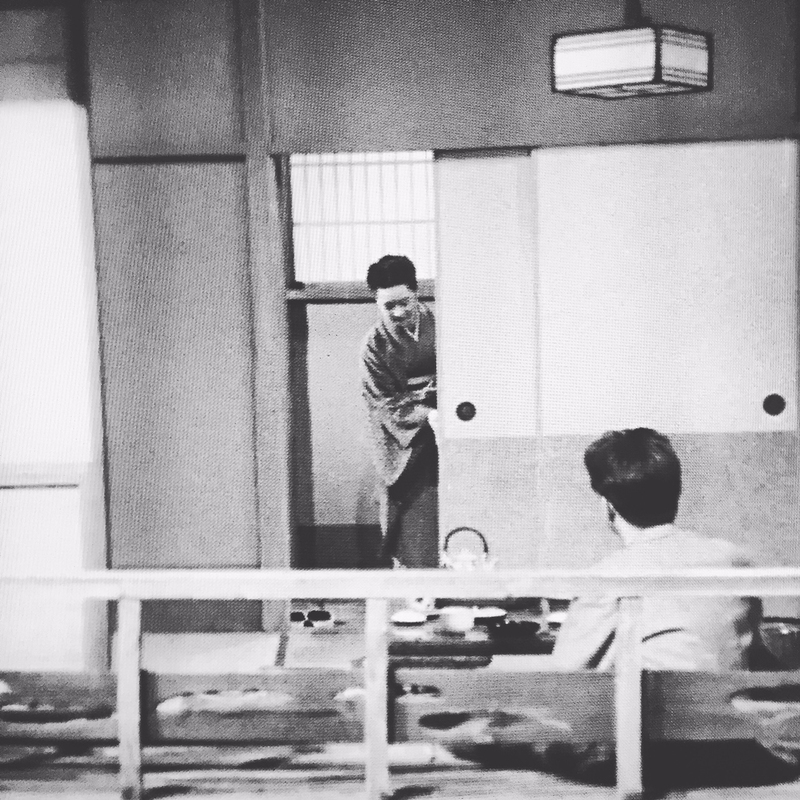 The go-to reference work in English about Naruse's films is Dan Sallitt's A Mikio Naruse Companion: Notes on the Extant Films, 1931-1967, which exists as a WordPress site accessible from the link. I've been reading his entries on each film after my initial viewing, and have been enjoying tremendously the lucid and sensitive considerations he's drawn from his own viewings over the years. The flat of Yukiko Tsujin (Kinuyo Tanaka) is not immediately or clearly defined by Naruse as her own. It might be an inn, like the one we'll see later in the film featuring a similar balcony set off the sitting-room; it might be the top-floor apartment of some commercial establishment she's involved with. Soon we meet a small child, her son Haruo (Yoshihirô Nishikubo). Who is the man dressing this morning to leave for work? Not a spouse; is he a john? A boyfriend? He goes by Fujimura (Masao Mishima). And this Kyôko (Kyôko Kagawa) who enters the scene: a roommate? A tenant? Yukiko's younger sister? She mentions a ¥3,000 bill due, which Yukiko promptly tells her to ignore. Relationships, definitions will become gradually clearer as the film progresses. In five minutes Naruse establishes the major themes and ambiguities of the aptly titled Ginza Makeup, and foreshadows events that will reach peak thrust only in the final 20 minutes out of 87, when it becomes strikingly apparent that the director has taken a coherent and practical découpage and grafted it upon an unusual dramaturgy: 67 minutes perambulating through the lives of a clan of hostesses down on their money-luck, when suddenly the prospect of a husband and a secure future for Yukiko materializes. It doesn't pan out. The man in question, Kyôsuke (Yûji Hori — no relation to Yûji Horii of DragonQuest fame) ends up falling for and getting engaged to Kyôko — a cruelty of fate of that stings all the more keenly given the closeness of Kyôko to Yukiko, especially given her role as a mentee (and, as is gradually revealed, a paid house-helper) to the elder woman, who throughout has been telegraphed as past-her-prime at 41: single with child, manager of a hostess bar, damaged goods. Following her son Haruo's short disappearance from home, Yukiko will become ostensibly re-grounded from Big Notions: the boy's comfort in joyful lone wanders amid the neighborhood in pursuit of a pick-up stickball game or a bucket of fish contrasts starkly with the mother's hitherto alleycat necessity of the lean-to noodle joint and crepuscular shortcut.